It is an honor and a privilege to announce my solo exhibition, New Realism, at the Bakersfield Museum of Art, on display from September 13 – November 25, 2012. The show features fourteen of my book themed paintings, a subject I have worked with for the past several years. 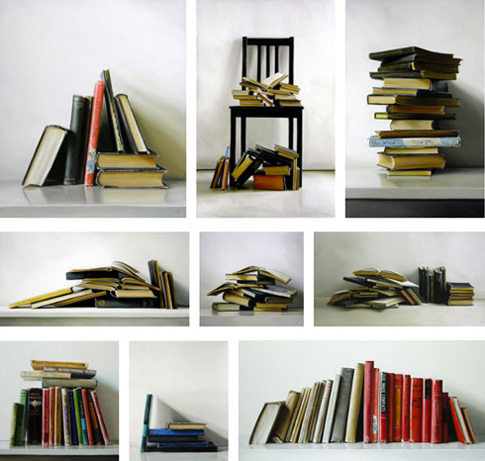 I have slowly refined the way I use books in my paintings. What were once simple props, I started paying closer attention to the actual books. Vintage primary readers are particularly interesting. With overtly optimistic and naive titles, they are a great example of the way our culture idealizes our recent history. Contrasted with early phsycoanalytical books or heavy psychology and ethics texts from the early 20th century and you have an interesting juxtaposition. At the same time, the simple rectangular shapes, the colors and textures of the spines and pages make for endless possibilities for me as a painter to explore. The organized and tidy stack of vintage and antique books have small details in torn edges, fraying covers, dented spines, discolored pages. 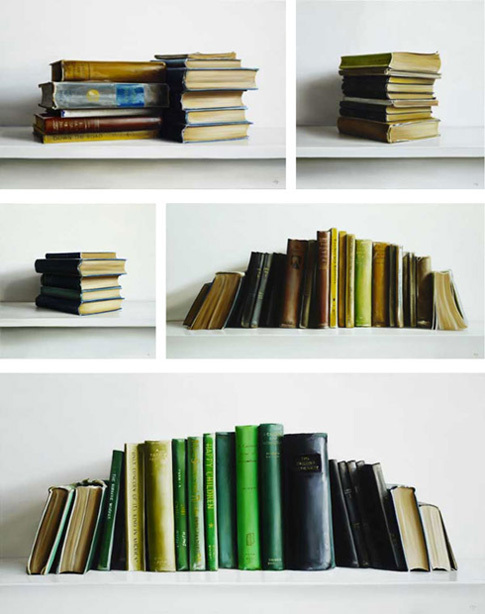 A jumbled pile of books, a line of books precariously leaning on one another. All set on softly lit neutral grounds and a clean white shelf. I like the universality that books as objects present. They are symbolic. They are our combined and collected knowledge printed for posterity, all on decaying paper. We fret over losing the art of reading, the genuine experience and pleasure of a book as we invent and perfect new ways to consume the written word. iPads, Kindles, smartphones — ebooks, they are becoming commonplace and cheaper by the day. I think that as long as someone is writing something worth reading, it doesn’t really matter how you take it in. And as long as second-hand book stores and antique shops have multitudes of books to offer, I doubt I’ll ever run out of ideas that I can transform in to paintings.